Truthfully, I would have loved to start my Animal Reiki journey by fostering dogs. 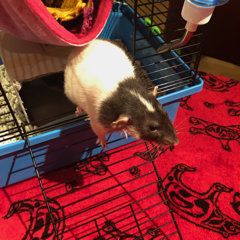 Since I have a tiny condo, no yard, a dog named Berkeley who enjoys living in a single dog home, and a full-time healing business for people – fostering rats seemed like one of the feasible alternatives. I had no idea volunteering with RattieRatz would be so rewarding. After a year I ended up devoting as much time as I could to RattieRatz: fostering two or three rats at a time, assisting at the adoption/educational events, transporting animals, picking up cage/supply donations and attending RattieRatz potlucks. I have learned so much about taking care of rats, setting personal limits and boundaries, and the sometimes harsh reality of animal rescue work. I have also learned to let go of my desire to “make the rats adoptable” and just “be” with these beautiful beings. It has been an incredible two years. Another very surprising aspect of this journey is how uplifting it is to work with the other volunteers of RattieRatz. I have found it so life-affirming to watch the care, the respect and love these people have for every rat that comes through the rescue. Over and over I have witnessed the dedication of the many volunteers who put their compassion into action over the well being of such a “small” life. 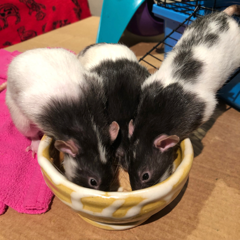 Animal Reiki is the foundation of my work with rats and was extremely helpful with Taki and Shin, two very young, petite black and white hooded rats. They were bred to be snake food and were rejected by the snake soon before it died. Taki and Shin were the most traumatized animals I have ever seen. They would freeze and flatten themselves against the back of the cage whenever I approached and would not move a hair, even when I offered a cashew. It was heartbreaking. As you can imagine, Animal Reiki was extremely helpful for them and me. Holding a meditative space in which I felt at peace with their trauma became a solid ground to begin their healing. It took over two months, and the smell of an older male rat on my hands, for them to let me pick them up. Hormones can be helpful. Taki and Shin became two of the most affectionate and interactive rats I have ever fostered. They found a wonderful home with two other rats and I received several emails from their attentive adoptive mom. Saltine was a PEW – pink eyed white – rat that shared quite a bit of Reiki with me. He was the fastest rat I have ever tried to hold. Even though he eventually enjoyed running out of his cage and on to my lap via a ladder, he would never let me pick him up. Saltine taught me to just “be” with him and accept him on his own terms, even if those terms kept him for being adopted. I had to let go of my expectations of him. Happily, while he was with me, he bonded with a second chance lab rat named Sammy, and they found the perfect home together. Rats are highly social animals and are always adopted out in groups of two or more unless they are to be bonded with another solo rat. 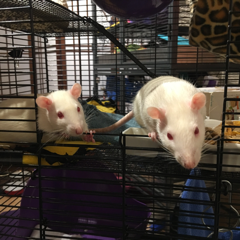 RattieRatz was sent playful videos of Saltine and Sammy learning tricks, like running up their adopter Dad’s leg from their cage. I watched that video several times. 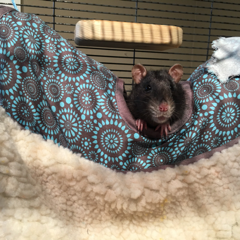 Meditating with and taking care of my foster and sanctuary rats has greatly deepened my healing practice, and I have many more beautiful Reiki Rat stories to share as soon as I get the chance to write them.